← The Daily Hunch – a NEW Astrology Subscription Service! February came and went with more gifts than just on Valentine’s Day! My Degustabox arrived early in the month, packed up with a variety of delicious snacks, drinks, sauces and other ingredients. For $19.99 per month (shipping included), you can get this monthly foodie box delivered tok your doorstep! Best of all, you can use code DEGUSTA10 to get your first box for 50% off! They always include some items you are probably familiar with, some brands and products that are new, and a few unique items. I’ve been eating Popchips for a while, so I was happy to see these Popchips Potato Ridges in Salted and Tangy Barbecue. They’re a little bit lighter and more pop-ier than a typical fried potato chip and a good combination between popcorn and chips. 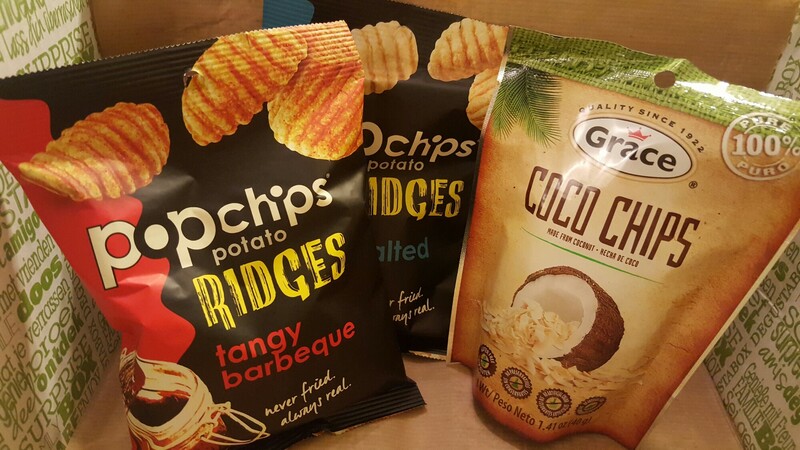 If you love coconut, you will go nuts over these Grace Coco Chips. They are a bit crunchy and toasty with a great coconut flavor. I definitely recommend sprinkling these + chocolate chips into yogurt for a light dessert, or pairing with dried fruit and nuts for a snack. One of my favorite brands of chocolate, Green & Black’s Pure Dark Chocolate with Sea Salt is seriously delicious. I highly recommend this brand because all of their cocoa is sourced through Cocoa Life, a global program that invests in sustainable cocoa farming. 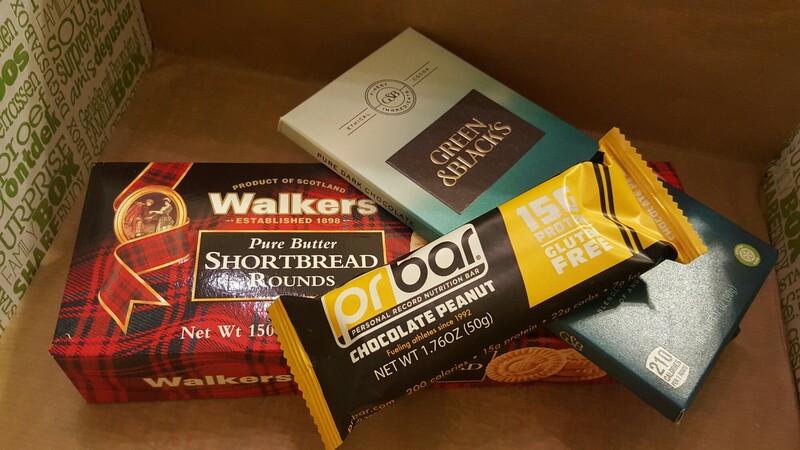 These Walker’s Pure Butter Shortbread Rounds are classic cookies; nothing extravagant, but that perfect butter cookie for having with tea. This PR Bar in Chocolate Peanut Butter has 15 grams of protein and 200 calories, so they’re perfect as a meal replacement or a high-protein pre or post workout snack! They’re not gritty or super fake tasting, so if I can’t get a ThinkThin or QuestBar, I would definitely pick one of these up. This Slendier Calorie Clever Spaghetti is a unique noodle-like product, made from konjac flour, which is a root vegetable. It’s very high in fiber and low in carbs (and gluten-free), which is perfect if you’re craving pasta but don’t want the high carbs and heavy feeling. Unfortunately, it doesn’t smell or taste great upon opening- you really need to rinse it first and then cook it with sauce, spices and other ingredients to make faux spaghetti. 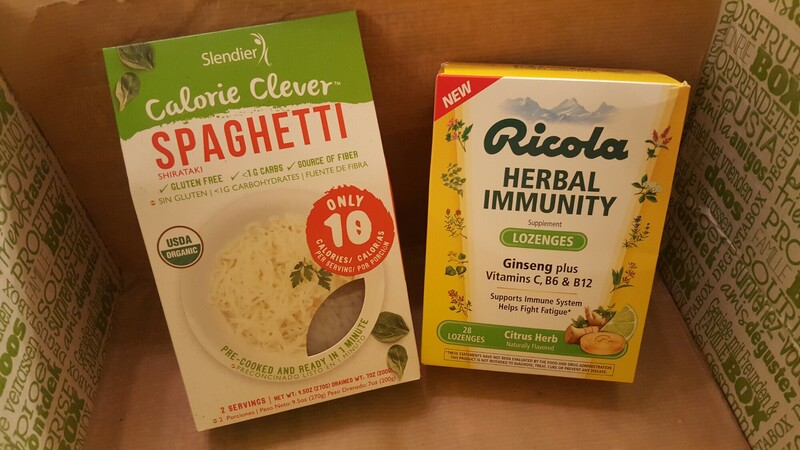 These Ricola Herbal Immunity Lozenges in Citrus Herb smell and taste great and soothe a dry, sore throat. I feel like throat lozenges have been in a lot on my Degustabox’s lately. Definitely not hating on it, but an interesting item to include so often. I LOVE Nando’s Peri-Peri Sauce and recently dropped and broke the bottle I had in my fridge, so this arrived in perfect timing. It’s savory and spicy and perfect with chicken, french fries and a variety of other foods. It reminds me of my semester abroad in Australia where we would go to Nando’s as much as possible! After that “Pumpkin Spice” Jones Cane Sugar Soda, I was a little skeptical to see another orange Jones bottle. However, this Orange & Cream Soda is pretty delicious and helped to clear my anxiety regarding another crazy soda flavor. These Bandar Spicy Mango Chili Sauce packets looked like an added value/sample in the box. They’re like a sweet chutney meets a spicy savory hot sauce, and I would probably pair then with Indian or Thai food. All in all, this was an interesting combination Degustabox. I really loved the Dark Chocolate with Sea Salt and the Grace Coco Chips. I do wish this box had more healthy, unique items and brands that I haven’t had before, as this one was mostly chips and sauces and lozenges. What did you think of this month’s Degustabox!? See previous reviews here.